From the message it looks correctly flashed, that's already a good point. 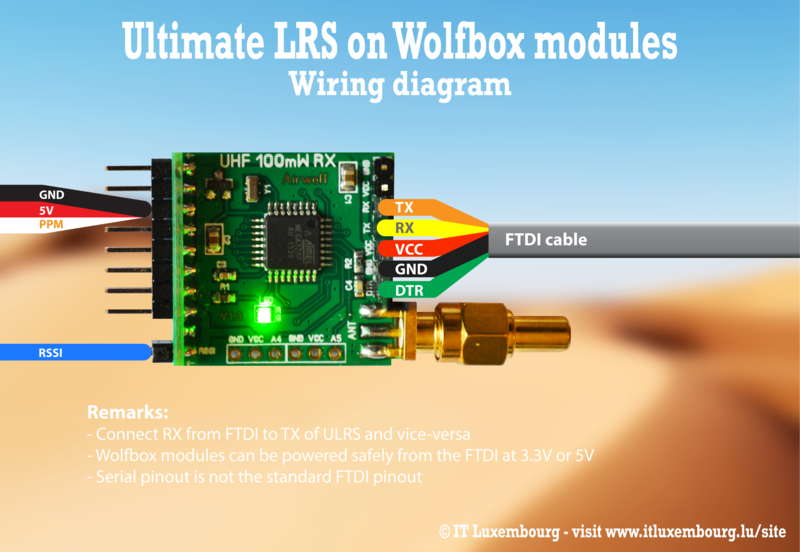 Can you describe exactly the ULRS board type you're using, the FTDI brand, power supply, antenna used and computer type ? Do you have bluetooth on the computer ? I don't see anything that should be blocking here but this is just in case. Connect everything before launching ULRS CC. I'm so delighted how good this works ! Great work mr. flip flap ! Another Thing i'm wondering about is the 30day limit for the Beta ?! Hi and welcome to the thread and rcgroups ! 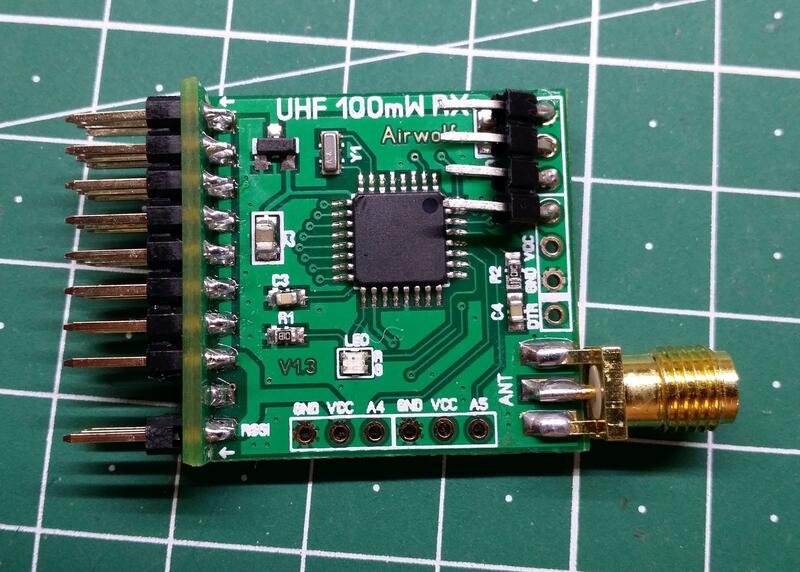 I see you've found the answer, for the short story there was a mistake in the Spongeboard PCB, so the PPM goes to a different pin than on other ULRS Mini boards. That's why there's a parameter to select if it's a spongeboard or another board. The link you've mentionned is about the spongeboard. Don't worry for the 30 days, it's just to ensure that we don't have a lot of buggy versions in the wild : almost everyone is using the latest version thanks to this limit. And there will be a stable release (paying) with a life-long license soon. That was on a pro mini for a butterfly board (the only mini board that I have all the parts to build). Maybe I have a bad batch of pro mini's? I just tried to flash an old orange 100mw rx that I thought was no good and it worked. BTW, before this problem I couldn't even upload the firmware. I ended up changing the avrdude files that CC was using to the ones that came with ULRS 1.06 and it finally uploaded the firmware. So it just stopped working again. Both LEDs on both modules are flashing. Constant beep from tx when I turn off rx. I plugged the rx back in to CC and it didn't recognize the board. When I upload the firmware again it shows my parameters and works until I unplug it. This is basically a repost from a page back but im updating it with instructions. So just to recap, my final design for the ULRS mini. TX & RX boards. - Switching regulator running everything at 5v. - Your choice how you finish off the antenna setup, eg. 5cm pigtail sma lead etc. PDF Instructions attached, pics lost a bit of quality, so attached the jpg images to help out. Last edited by neo__04; Jan 29, 2017 at 06:05 AM. Wow, I like that it's through holes, and everything looks clean and aligned, that's the next board I'll build. I'll upload it to the site this evening, thanks again Neo ! One thing I saw was that the FTDI serial port on the top of the butterfly board is backwards from that of the pro mini. But I was just trying to upload firmware to the pro mini by itself at that point. I'm looking at the other mini boards now. And I have another orange rx board on its way for a backup. I've run side by side the 1.3.37 and 1.3.38 versions of Mission Planner, and while the 1.3.37 shows 0 lost packets, the version 1.3.38 shows 10% of missing packets. It seems to be a bug in the 1.3.38 because this is not reflected on the signal quality indicator (98%), and even the max time between packets seems abnormal (272 ms). This occurs even for low bandwidth usage, here the 1.3.38 was only at 976 bytes per second. (In comparison the 1.3.37 had no packet loss at 1660 bytes per second). Apart from this the behaviour of Mission Planner seems correct. I opened a few weeks ago an issue on Mission Planner and this is now solved : it works in the current beta version of Mission Planner, and should be propagated soon in a stable release of Mission Planner. Notice that the current version of MP (1.3.43) still shows the issue, you got to upgrade to the beta. I'm sorry I can't confirm as I don't have a butterly board, but if you're looking for other boards I can recommend the spongeboard, assembled in 20 minutes and works every time. There are other excellent boards too, I'll make a page per board so user will be able to post their results in the comments. Also got several Samiboards and they work fine but it's SMD so more complex to solder. Thanks Ben. I have no trouble soldering SMD components. I ordered butterfly boards a while back before the others came out and I have all the components for it. After a couple weeks of rain the weather is finally getting nice again and I want to go fly! Lately its been flashing the firmware but I think I got that figured out. My neighbor had an extra Orange 100mw futaba tx and I was able to flash it. Seems to be working now. Going to try it out tomorrow morning. Does anybody have a picture of the other side? Hi Flipflap , do you planing to support KHA schematic Transmitters (there are a lot on hand now, ( yes I know about 5 volt and so on - but they work perfectly and 800 mW is a good power) ). Maybe for paying version?